Students studying part-time at Cardiff University’s Continuing and Professional Education (CPE) have secured a place in the final of the 2017 Enactus UK National Expo in London. The students are enrolled on the Pathway to a Profession and have recently completed Realising Your Potential in Business module which was delivered by Professor Tim Edwards, (Responsible Innovation Network, Cardiff Business School). The Pathway to a Profession is a joint partnership between CPE, Cardiff Business School and the Welsh Refugee Council. The project also works with Enactus, an organisation with the aim of inspiring students to improve the world through entrepreneurial action. 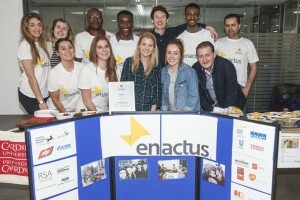 The Pathway emerged from the need to offer refugees and asylum seekers with existing degrees from their home country and considerable work experience the opportunity to build prospects by developing social enterprise ideas inspired by a novel collaborative arrangement with the Cardiff University Enactus society that has partnered Enactus and Pathway students. Ideally this will assist the refugees to find work as soon as possible, to support their families and settle into their new life in Wales. It also offers the Enactus students valuable experience of working with members of the refugee community in ways that could potentially improve future openings for those Pathway students. 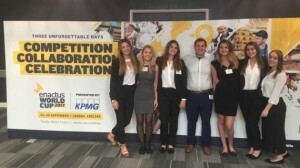 As part of their coursework and assessment the students developed a social enterprise presentation which was successful at the Enactus regional heats and secured a place in the national final. The presentation outlined how the partnership between CPE, Cardiff Business School, the Welsh Refugee Council and Enactus has created a unique opportunity to build a learning environment that enables asylum seekers and refugees to work with extremely able undergraduate students, in creating social enterprises directed to helping members of their community integrate more easily into their new lives in Wales. The Students have showcased their enthusiasm for social enterprise and their commitment to their studies. The strength of this particular pathway, believed to be the first of its kind, is it enables students from non-traditional backgrounds to partner with undergraduate students to realise their potential. Different departments and Schools at Cardiff University have effectively worked together with the Welsh Refugee Council to achieve widening participation aims. An immediate benefit for some of the Pathway Students has been the opportunity to progress onto an MSc in Business Strategy and Entrepreneurship at Cardiff Business School. The Pathway has been hugely successful and will continue to run in the next academic year to support future students to realise their potential.